VMware Certified Design Expert (VCDX) is the highest level of certification offered by VMware. The VCDX certification allows you to highlight your enterprise-class skills in VMware Solution design and implementation. 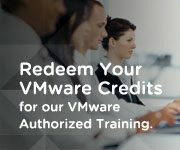 VCDX-DT requires enterprise-class vSphere and data center virtualization skills but the focus is on delivering virtual desktops and mobile computing solutions with the VMware Horizon Suite™ and building out the infrastructure to deliver a consistent, rich end-user experience across multiple devices. Earning the new VCDX–DT certification from VMware will validate your world-class vSphere and VMware Horizon Suite design skills, and will make you one of the first globally-recognized enterprise-class Virtual Desktop and Mobile Computing Solution Architects in the industry.